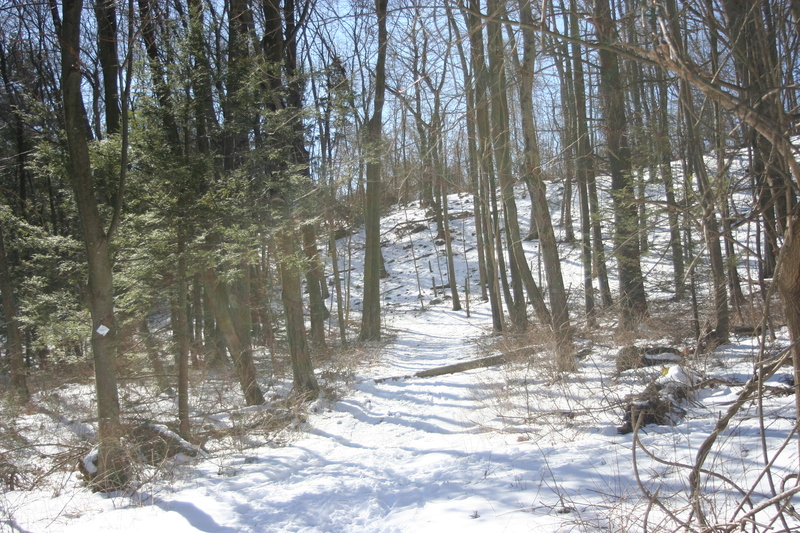 If you take the Woodland Trail from the farm road you head up a little hill. At the top there’s a turn off to one of the other trails. I like to stay on course for a while. 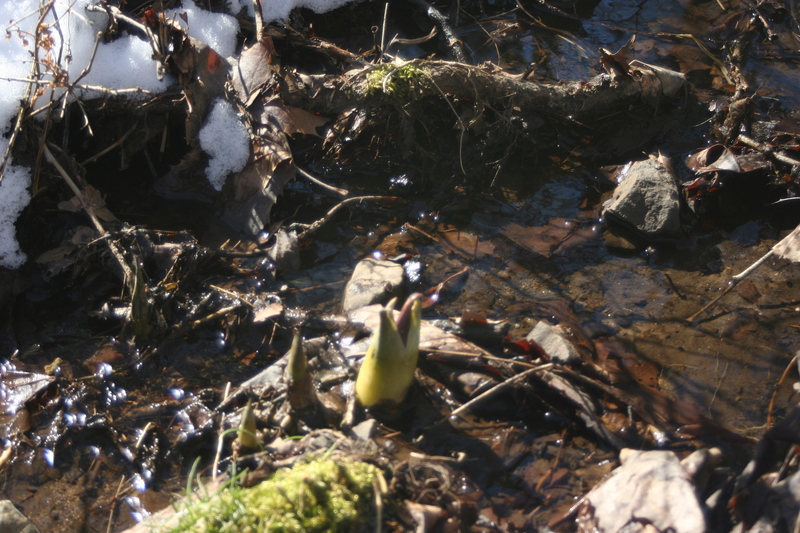 There are other opportunities to switch, and I enjoy heading down the hill to a little dell where an ecotone forms. 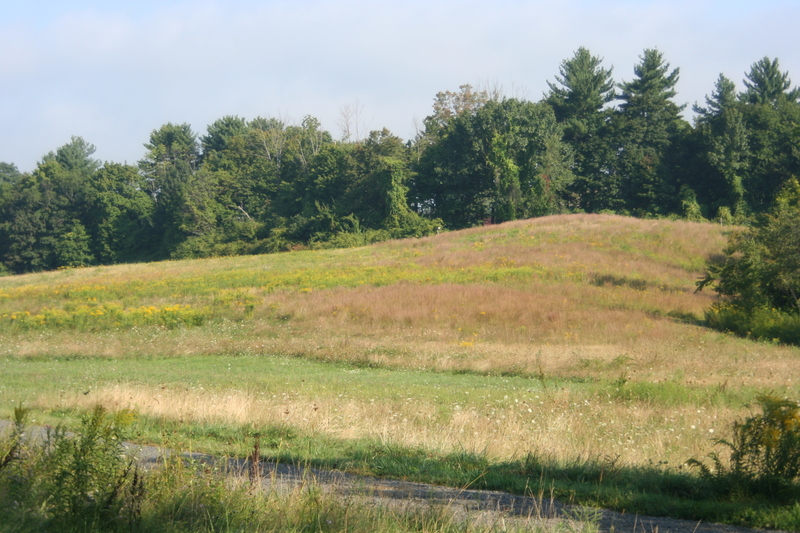 An ecotone is an area where different kinds of habitat meet. They can be rich locations for all kinds of wildlife. This spot has a tiny meadow, some scrubby woodland and a nearby wetland area. You can find many birds and the spot just has a good feel. I often linger and see what turns up. 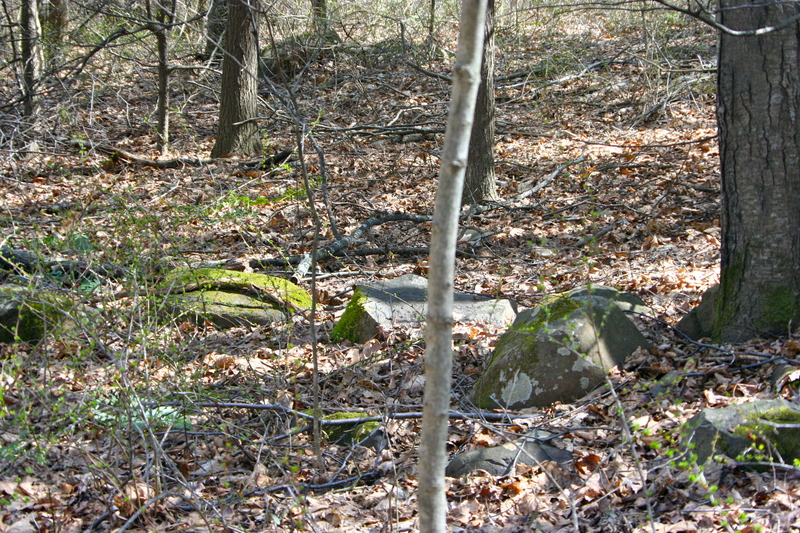 Looking to the left at the bottom of the hill and toward the back of the little meadow there, almost right under Route 4, you’ll see a stand of trees with very straight trunks clustered together. It looks a little Burnham Wood-Come-to-Dunsinane, but I checked and there isn’t anyone hiding in there. Every one of the trees looks the same, sort of. Trunks are similar and the height varies, but none are much out of proportion with the others. The wacky part is the leaves. Some look like a simple ellipse, others like a mitten. A third kind looks to my eye like a dinosaur footprint. What tree produces three different kinds of leaves? Actually, there are a few species like mulberry and burr oak, but the habits and the characteristics of the sassafras (never mind the rollercoaster name) are really neat. 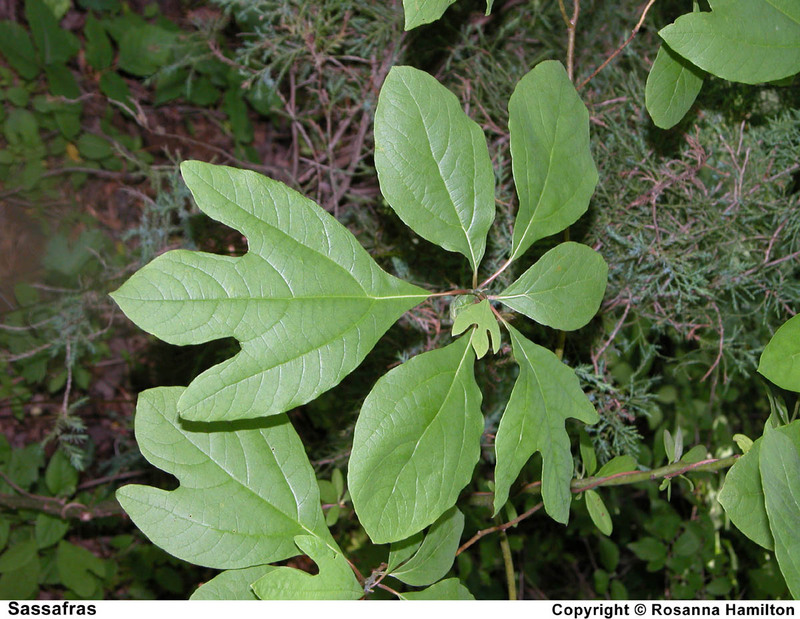 Sassafras is the “go-to” plant for loads of folk remedies, yet at the same time has a bad reuputation with the USDA as a potential carcinogen. Go figure. The hill people versus science. Who knows what to believe? Frankly, as a confirmed lover of Cajun food, I have to endorse the use of file-a key ingredient of gumbo. I like the old Hank Williams song-“Jambaya, crawfish pie and the file gumbo….”-my mother used to sing it to me. 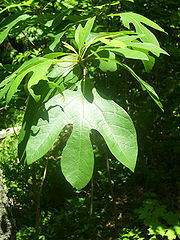 The leaf of the sassafras is dried and crumbled to produce the spice and thickener essential to so much Cajun cuisine. Among the many other uses found for it over the centuries, sassafras has taken a star turn in candy, root beer, soap and perfume. 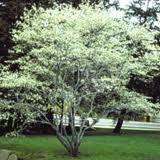 After its introduction in Europe, it was served up in England as “saloop”-sassafras tea served with hot milk. Everyone loved it so much that it became in 1610 a condition of the Virginia charter from England. 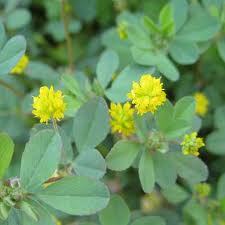 It also found favor as a remedy for colds, rheumatism and skin disorders. 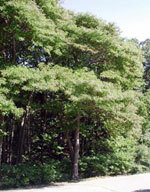 The sassafras, known sometimes by Native Americans as “the greenstick” tree, starts out just so-as a green stick seemingly growing without obvious genesis. 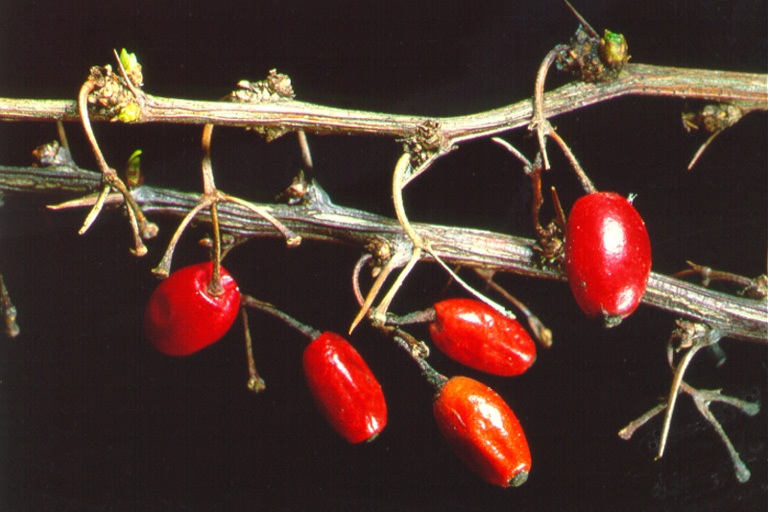 While the plant can grow from seed, the most common (and annoying I am forced to say) is its habit of growing from “suckers” or volunteers from hidden rootstock derived from mature trees. 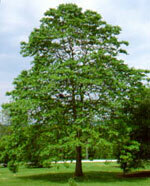 Sassafras can grow inches a year, so it gets big quickly. Loads will grow all at once. A full grown tree can reach sixty feet, so it’s hard to imagine you wouldn’t see the the materfamilias, but with a big crown, the mama can be pretty far away and you might not notice it. The greenstick volunteers grow in horrifying profusion and are practically impossible to get rid of in a backyard or garden. In a sense, you have to give the sassafras some credit. The suckers spring up in droves when the originating tree is cut down as if to protest the demise of its kinsman and keep the bloodline going. Thus the army of them down by the Woodland Trail. 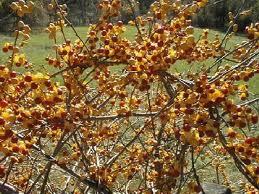 They are hardy nearly everywhere, and in many cases prized as an ornamental. In places it is loved for the pretty fall foliage, which can develop in an amazing variety of colors. 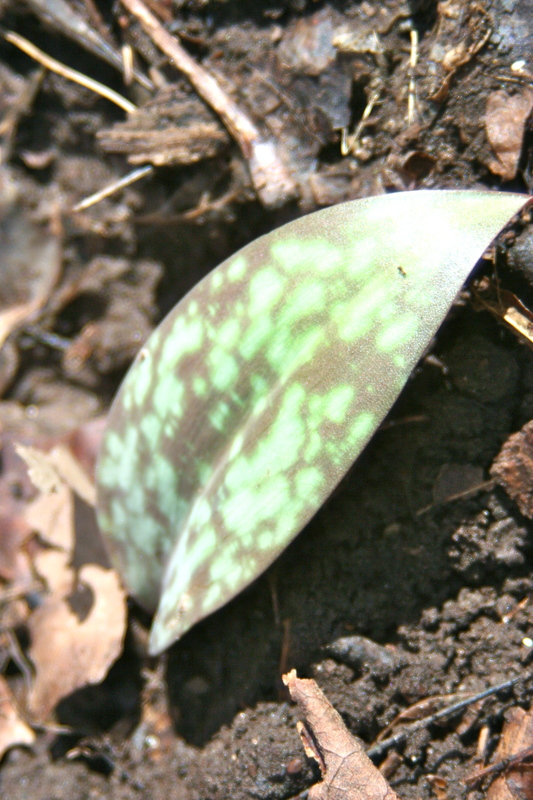 Crush a leaf between your fingers; whatever else you may think about its growing habit, you’ll love the fragrance. This member of the laurel family disperses its pretty perfume quite readily, and you may find yourself pining for a root beer. I get a sinking feeling when the year winds down. As the old song says, “the days grow short when you reach September”. I have the emptiness that comes with leaving and with loss. It’s a little like moving day when you look around at the boxes and the spaces on the walls where your pictures used to be. Not that fall is complete misery. It’s just time to move on. The crackle of leaves is pleasant, the misty mornings and the ambiguous nature of the weather has a certain joie de vivre. Our meadows are mowed, well after insects need them and way after any nesting grassland birds have moved on. We follow a plan recommended by the USDA and our state DEP, hoping that proper management will encourage decling species to keep a foothold here. We do everything we can with our meagre resources, and try to be conscientious. It’s a different landscape without the rippling grasses and wildflowers. The crickets are still singing day and night. But the walking is crunchy now with a little frozen dew in the morning. It isn’t really a frost, but it brings frost to mind. I had just finished a walk the other day, in freakishly chilly, drizzling weather when a few snowflakes fell. I wasn’t ready for that. All was well again two days later, with waves of chirping sparrows coming through and the crickets back at their singing. You can’t deny the foreshadowing though. Autumn is the season of dispersal as well as hunkering down. Flowers have gone to seed, and you aren’t worth a toss as a naturalist if you don’t come back from a walk with a few “hitchiker” seeds sticking to your sweater. 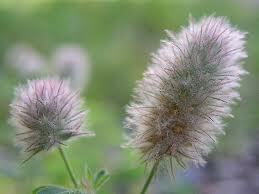 I pull the burrs from the burdock and give them to my little daughter. They are “nature’s jewelery” when you stick them on yourself. Several together can make a stunning brooch. 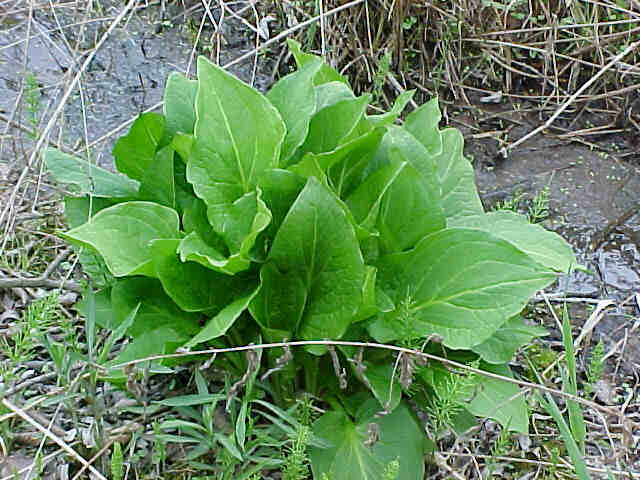 Some say burdock was the inspiration for velcro, since it has a sort of hook-and-eye construction, but I think this may be more country legend than truth. Tickseed can make a real mess for you to painstakingly yank out when you get home, and there are loads of other flower seeds that like to take a ride when they can to travel somewhere new to grow. There are so many ways for a plant to get around. Hitchikers are one, but I favor the seeds who take to the air. Except for being afraid of heights, balloon travel has always appealed to me, so maybe that’s the reason. In spring, who doesn’t enjoy blowing the seeds off a dandelion clock with a big puff of air? In fall I’d have to say that milkweed might be my favorite, with it’s silky strands that really seem like parachute material holding on to the seed at the bottom. The seed is the balloon’s basket, of course. The whole affair is enclosed in a sort of warty-looking pod. It’s shaped like an elfin ear. When they are green you can split them open and yank out the silk and the seed. The inner wall of the pod is smooth and soft. When fall deepens, the pod gets brown and breaks open on its own, freeing the silken seed parachutes to fly far and wide on the breezes. I cheer them on, hoping that every single one will yield a plant. It’s a vain hope, but of course that is the nature of hope overall. Still, it would be nice. 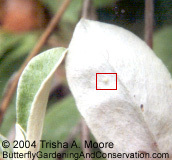 Milkweed is the foundation of life for the Monarch Butterfly, who eats and lays eggs exclusively on this plant. 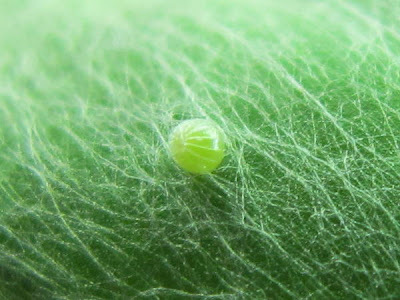 The milky latex sap of the milkweed also confers bitterness on the bugs, so that birds who try to eat them only try it once. It cuts down on mortality quite a bit. 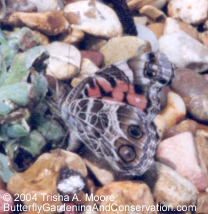 Lose your milkweed and lose your monarchs-it’s simple. 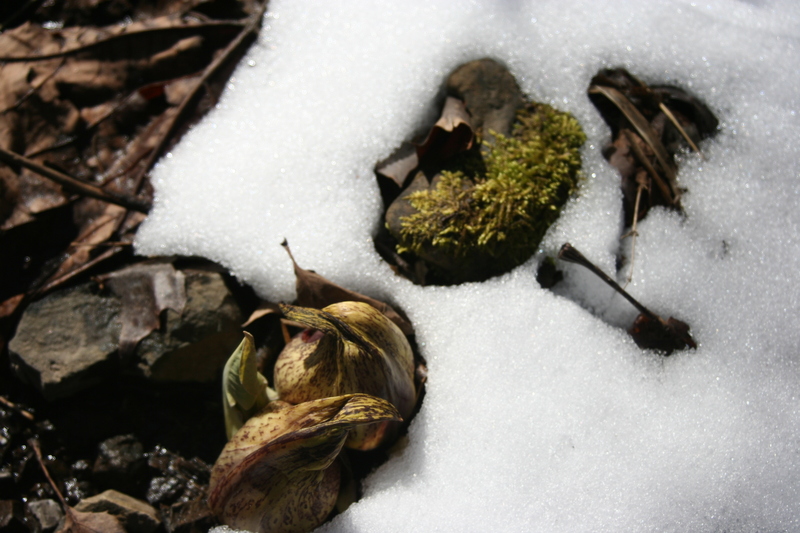 Some plants just hunker down right where they are. After pollination seeds form and just drop right there. It doesn’t always happen right away. Many of them drop their seeds over the winter. 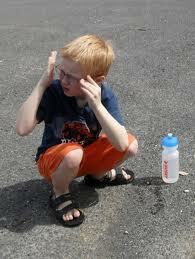 Nature has it timed so that they get moisture and light just right for them to germinate properly. During the fall you can see them all clustered up, waiting for a good, stiff winter wind. 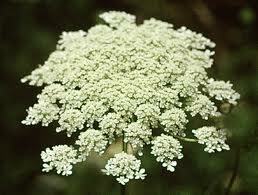 Queen Anne’s lace puckers up its umbel into a neat package, a lucky haven for many insects. A great walk is to go from plant to plant gently teasing open the umbel skeleton to see if something is tucked up in there to pass the winter. Crab spiders can often be found, and others who spin tiny webs inside the umbel, a shelter within a shelter. Little beetles and weevils lurk in there, too. You never know what you’ll find. It’s a world in a wildflower. 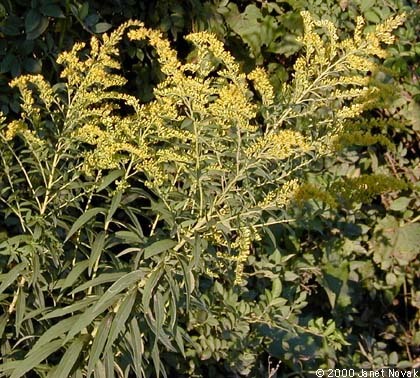 A lot of people are sneezing and coughing these days and goldenrod often gets the blame. Folks say, “Oh, the goldenrod is out right now,” whenever anyone so much as waves a hanky. Since goldenrod is bright yellow and there is tons of it in bloom you can’t really fault the logic. But there is an inconspicuous culprit who is really to blame. How maligned the goldenrod is! The real guilty party is ragweed, a ubiquitous and undistinguished-looking plant. Easy to overlook, it is the covert cause of suffering for many. Goldenrod is a noticeable late-summer and early fall plant. Its cheery color makes up for the fact that it signals the waning of summer. But that brilliance gets attention and so the plant becomes a scapegoat for the riot of rhino-misery that occurs at this time of year. Ragweed serenly flies under the blame radar since it just blends in with grass. 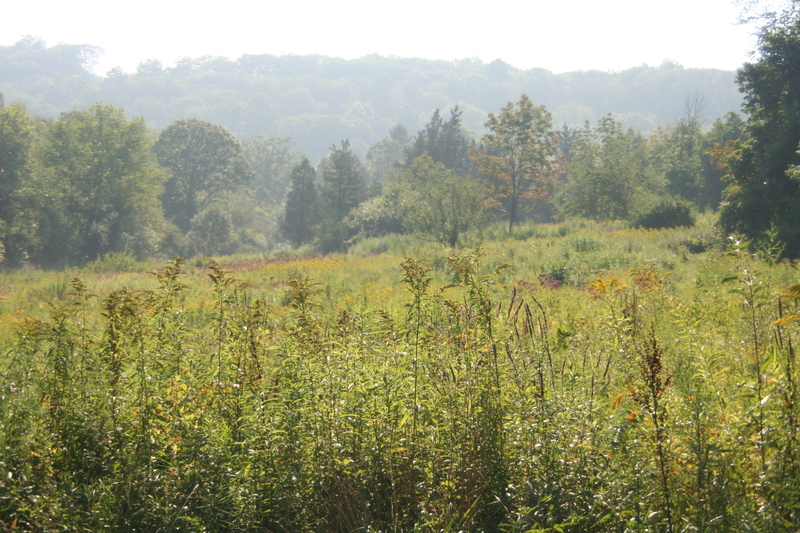 Goldenrod has taken advantage of the land use trends of the last 350 years or so. In the earliest era, most of the landscape was forested. But as land was cleared, goldenrod moved in. It can be vexing. There are fifteen or more native to New England, and they look enough alike to confound efforts to identify them individually. Plus there are hybrids! Not to say identification is impossible. 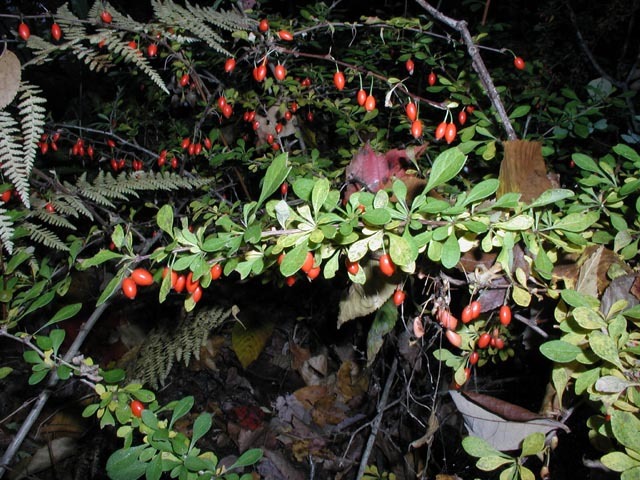 There is a great article on the Connecticut Botanical Society website, with a “key” to suss out individual plants. The fact is, the reproductive habit of goldenrod eliminates it as a hayfever culprit. 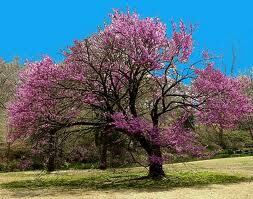 Pollen is the enemy of allergy sufferers, and early spring begins the season as flowers begin blooming. Mid-summer is a time of relative relief, when the riot of bloom tapers off. Come fall goldenrod makes such a showy display it is blamed for the return of the rhino-catastrophe affecting so many. Ragweed hides behind its plain Jane coloration. Few suspect its virulent effect on the allergic. Goldenrod is a tidy plant. 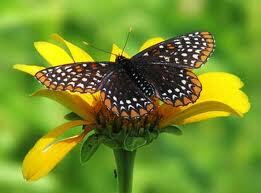 It “self-pollinates” because its pollen is sticky. Resultingly, the pollen drops into the middle of flowers on the same plant without blowing around to those nearby. The pollen doesn’t travel all. It just blankets its own flower with reproductive potential, quietly keeping its sexual adventures to itself. On the the other hand, ragweed is a trollop. It spews its pollen around with each puff of wind. 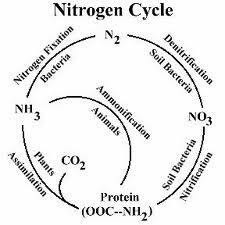 The pollen from the individual plants fly around fertilizing all the other ragweeds. It releases huge clouds of pollen. You know what that means: Mass suffering. Ingestion of antihistimines and nose sprays. Enrichment of allergists. Whether or not you are an allergy sufferer, it’s nice to appreciate the other late summer plants like goldenrod and the many asters that begin to bloom now. Take your allergy medicine and learn to identify ragweed and other early fall plants. 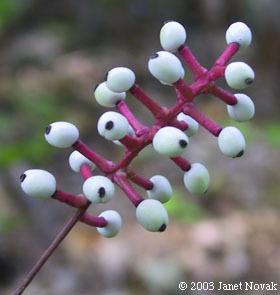 Baneberry is fun to look at with it’s small white globes and black dots giving it a fall name of “doll’s eyes”. And there are so many more and to see and enjoy. They don’t all make you sneeze. We musn’t accuse a plant for something it didn’t and can’t do. Goldenrod is more to be enjoyed than censured. Tell your friends. And pass the tissues, please. Hands off if you know what’s good for you! You may be the target of an assault by a wildflower! Seriously, Touch-Me-Not is beginning to bloom and I don’t think there is a prettier or more entertaining flower around. 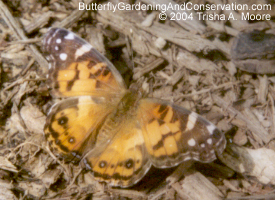 Orange and trumpet-shaped, it is flecked with a red “nectar guide”. 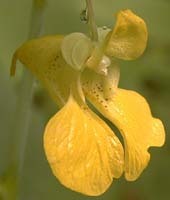 There is a yellow version known as “Pale Touch-Me-Not”. Growing in damp, shrubby stands, Touch-Me-Not gets its name from the spring-action of its seed-delivery system. 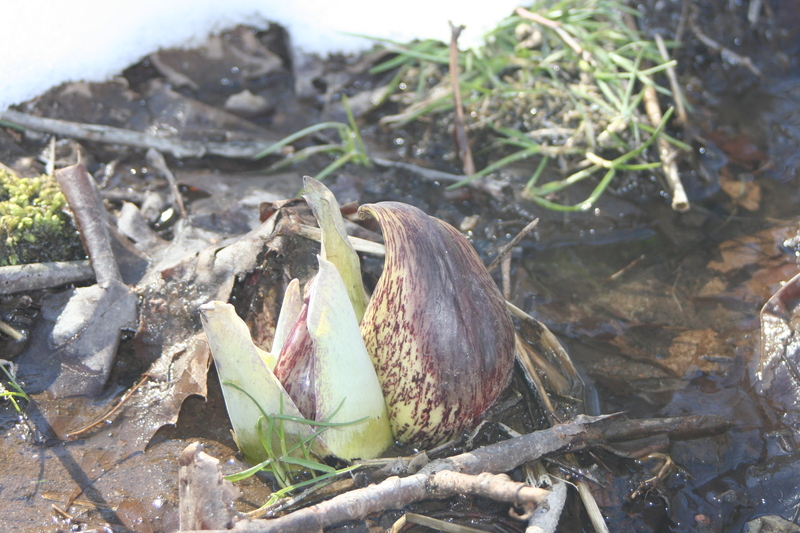 Mature seeds burst forth from the pod when touched. Boing! You can actually see the little tendrils of the exploded seed pod after it shoots off. They look like watch springs. The seeds can launch themselves over a very wide distance. With a little practice you can learn to catch them when the pod explodes. If you manage it, eat a few. They taste like walnuts. The very same plant is also known as “jewelweed” for the silvery coloration of its leaves when wet. “Jewelweed” and “touch-me-not” are interchangeable names for the same plant. They are members of the genus that contains the impatiens flower loved by gardeners with shady yards. But like most living things the wild version(s) are hardier than their cultivated counterparts, and although touch-me-not is said to prefer damp places I’ve seen it grow in dry spots too. Nursery-bought impatiens curls up its toes and dies in the sun and heat. In order to be biologically successful in this world, it’s better not to be too fussy. It’s also helps to be more than just a pretty face. Touch-me-not is endowed not simply with good looks and a talent to amuse. It is also known as an effective antidote to poison ivy. 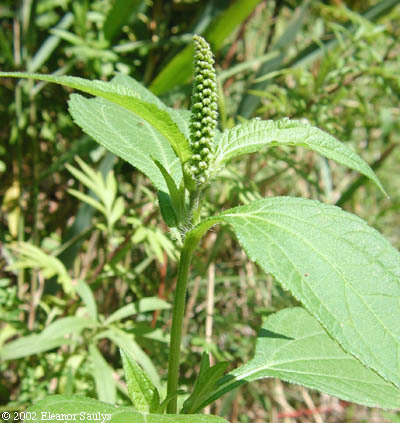 A component found in the stem of the plant neutralizes the urushiol oil that makes PI so itchy. If exposed to poison ivy, look around for some jewelweed. It shouldn’t be hard to find. They grow in similar places. The “cure” is simple. Crush the stem and rub the liquid anywhere the evil ivy has touched you. Blisters may fail to appear at all, or may be less irritating if they do. Even if you can’t find any jewelweed and you break out in the typical rash, jewelweed can mitigate the symptoms. I heard of one chap (though the truth of the story can’t be verified) who unwittingly made love to a woman in a patch of poison ivy. 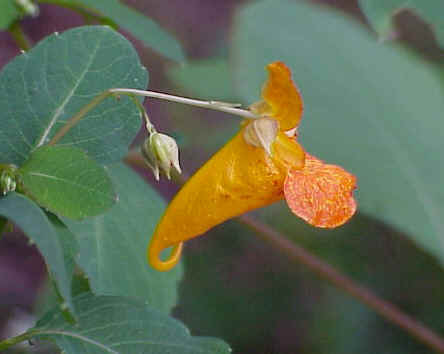 As an Eagle Scout, he knew of jewelweed’s properties, and upon realizing his recklessness used the liquid to mitigate the possible results of his actions (at least one of them). Apparently, the woman was “non-reactive” to poison ivy. Touch-me-not indeed. 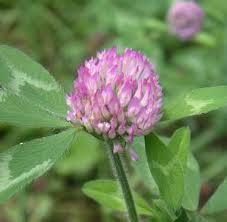 As a folk remedy, touch-me-not has also been touted as a cure for ringworm, burns, cuts, sprains and acne. I don’t know if it is effective against these ailments, but I do think the “poison ivy cure” legend is accurate. At least I hope it is for that Eagle Scout’s sake.